• Up to 70% of oral cancers are preceded by oral lesions such as persistent red or white patches in the mouth, in particular, on the tongue, the inside of the cheeks and the mouth’s floor. • Smoking and alcohol consumption are the main risk factors for oral cancer; both conditions together have a 35-fold increase in the risk of developing this disease. • Prevention is key to detect and treat this disease, therefore, the FDI World Dental Federation and SUNSTAR have developed a chairside guide to prevent and treat this disease from the dental setting. Download the chairside here. 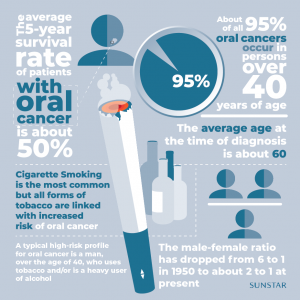 Oral cancer is one of the most common cancers worldwide, it is more frequent in men than women, and it usually appears at the age of 60. Early detection is essential to manage this disease, and it is possible since the most common sites for oral cancer are very visible areas such as the tongue, the inside of the cheeks, and the floor of the mouth. Therefore, to guide dental professionals and improve the prevention of this disease, the FDI World Dental Federation and SUNSTAR, a holistic healthcare company, have developed a chairside guide to prevent and treat Oral Cancer. On the World Cancer Day, it is relevant to remind that smoking and alcohol consumption are the main risk factors for oral cancer. In fact, tobacco (smoking and smokeless such as chewing tobacco) causes 90% of oral cancers. On top of that, individuals who smoke and drink have a 35-fold increase in developing this condition. “About 500,000 new cases of oral and oropharyngeal cancers are diagnosed annually, three-quarters of which occur in the developing world,” said Dr Ihsane Ben Yahya, FDI Council member and oral cancer expert. Consequently, encouraging the dental professionals to conduct oral screenings for early detection of this disease as well as helping them to work together for better management are the main priorities of the chairside guide launched by the FDI and SUNSTAR. This toolkit for professionals focuses on the prevention and management of oral cancer patients, paying particular attention to the screening process. The chairside guide provides oral health professionals with concise, yet comprehensive, information about oral cancer prevention, risk factors and management, and also helps them navigate the clinical examination and diagnosis through a decision tree. “For SUNSTAR, it is crucial to support projects that promote prevention and give the dental professionals a central and relevant role in the detection of several diseases. Dental check-ups can be the perfect setting for early detection since mouth and body are related, and our oral health has much to say about our overall well-being. Therefore, it is important to provide them with the right tools and support them along the way”, explains Dr Marzia Massignani, Sr Manager Scientific Affairs and Corporate Communications at SUNSTAR. The holistic healthcare company has been contributing to research and raising awareness about the two-way relationship between oral health and general health for many years now. Under #ThePerioLink project, SUNSTAR gives visibility to the many impacts of poor oral health, spanning from diabetes to sports performance, and encourages the population to take care of themselves holistically.